Customers love our truly traditional Afternoon Tea and now you can buy a Gift Voucher to give to somebody special to enjoy – or why not treat yourself and a friend! Served on a traditional 3-tier stand, there’s a selection of tasty finger sandwiches – Broadland Ham, mature cheddar cheese and free-range egg. Of course, our famous freshly-made Wroxham Barns scones are included – choose from plain or fruit served with jam and lashings of cream; or a cheese scone if you prefer. Plus a selection of delicious cakes and tea or coffee too. Valid for 12 months, our Afternoon Tea & Fizz for Two voucher is £29.95 and includes all the above plus a glass of Prosecco (or non-alcoholic soft drink alternative if preferred). If you want to bring a larger group, simply purchase more Tea for Two vouchers as needed. 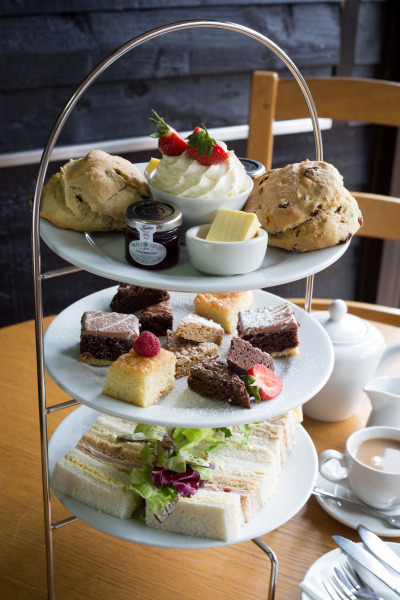 Afternoon Tea is served daily from 2.00 – 4.30pm and booking is essential to reserve your table – please quote “Afternoon Tea & Fizz Voucher” when booking. Tel: 01603 777106. P.S. if you can’t manage to eat it all, just ask and we’ll wrap and box it for you to take home!